After recently discovering the ease of use and durability of the Xtreme Series Hybrid GFRC System, Diane Husson has found fresh inspiration in her “new” medium of concrete. Since she was impressed with the results she attained (with her castings) from the Xtreme Series products, Diane was eager to try some of SureCrete Design’s other decorative concrete products. She was inspired to try her hand at a full-sized fish chair. 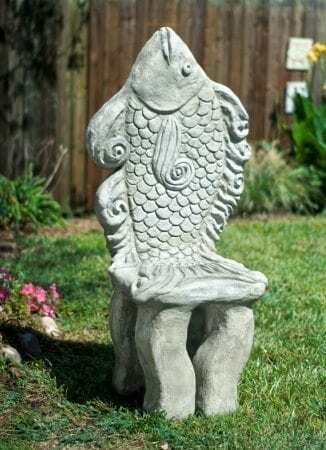 The fish chair is 50″ high, 19″ wide, 17″ deep and took several days to finish, as it is a multistep process. The armature of the chair was carved out of foam. When the structure was right, Backer Mix was applied and formed to the legs and underside of the chair and allowed to dry. Fiberglass mesh was used to enhance the fish form; it was coated with Wall Spray. (Wall Spray mixes with water, is easy to use, and can be integrally colored. )Wall Stamp (also mixes with water, is great for textured appearance, and initially cures in 8 hours) was used as a final coat allowing Diane to sculpt the details of the scales and fins into the concrete coating. Diane hopes, after further testing, to get into custom full-sized outdoor furniture. She looks forward to experimenting with more products and stains from Surecrete. Her experience with clay has helped her to appreciate that there is no shrinkage with SureCrete’s concrete products and that each product is compatible with others in its’ system. To explore her work visit newrelics.com.